This week I noticed my asparagus had come in and I waited to pick it for today but now it is too late as it has already branched out. I had no idea that once it is ready there is such a small window of time to pick. 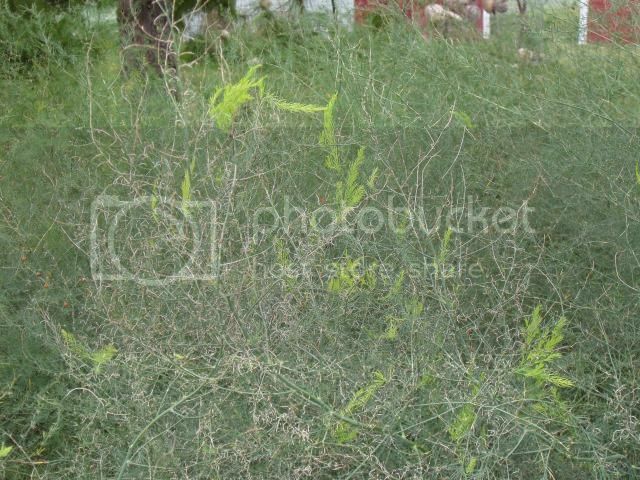 Oh well, I guess I will have another asparagus fern in my garden-again! Elfin, I have a fix for you. Asparagus panna cotta. 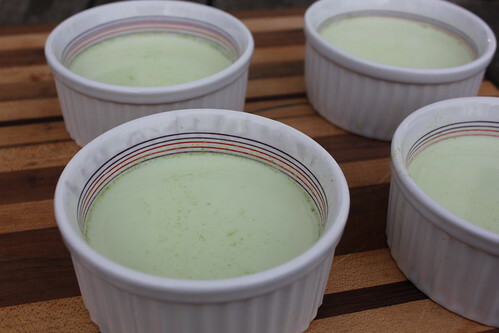 Just google any panna cotta recipe and add asparagus juice (I juiced some old asparagus I'd lightly cooked; you can put it through a blender or food processor, but if you go that route, you'll need to strain it). Makes for a very light, slightly vegetal and savory dessert. I think the temperature has alot to do with it. We have an 8' x 16' patch that was just giving us enough for two of us, a meal or two a day. When the temp got above 75 the end of last week, it really took off. It's growing so fast now we can't keep up with it. We took enough for 18 of us for dinner, at mom's today, and prolly have that much left in the patch. We'll probably start giving some away tomorrow. If we get rain tonight, which it looks like we will, it will really be out of control. Luckily, we've been eating it at least once a day for over two weeks, so we are just about ready for all of it to bolt, and we'll be done for another season. If you do harvest it after it has started to go to seed, just don't take it all. I think it's kind of hard on the plant to cut it after it's bolted. You want healthy roots for next year. Juicing the asparagus sounds like a great idea and useful for a lot of things. Thanks for the tip. 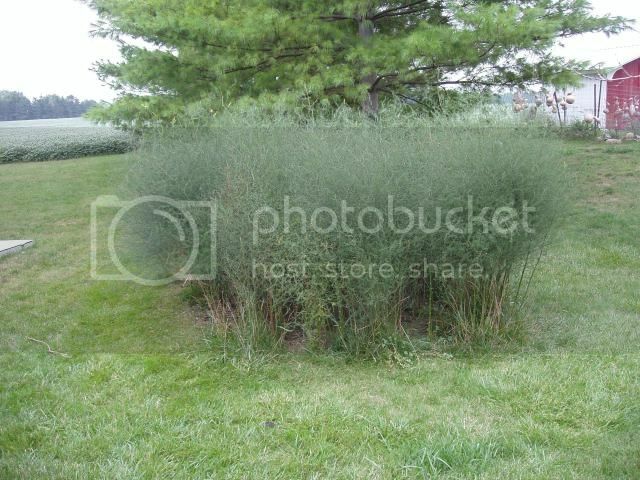 So after I have the fern all summer, I should NOT cut it all down for winter? Please let me know what to do to make sure I don't kill the plant for next year. I really love it and want to keep it going. Any input is most appreciated. Thank you. If your asparagus has been established for more than a couple of years, I think it will be pretty hard to kill completely... I don't think you want to mistreat it though. I'll tell you what we do, it's based on old timer advice and not so much old time experience. If anybody else comes along and says I'm crazy, they will be the new expert. This is just my experience and unscientific reasons. I was always told to leave the ferns on through the winter to catch snow for moisture. Thinking about that now, the last thing we really need in NW Ohio in early spring, is more moisture. I was also taught to burn the ferns off in early spring, this will blacken the dirt and it will warm up faster, so you'll get spears earlier. Where I grew up, we had The North Farm, on the north farm, was The Old House. It was an abandoned homestead, a half mile walk from home, or about a mile and a half if we drove (the point is we usually walked). Anyhoo, there was a big old asparagus patch back there that had been around for ever. We had a small patch at home, but if we needed alot for a big meal, we'd go to the old house. Sometimes, we didn't get the old ferns burned off and there was always new asparagus coming up, the same time we were getting it at home, in the patch that was "properly" cared for. Here's what I think; the ferns go to seed in the fall, but they hang on the plant until spring. Jostling the plant around, cutting it down to burn, knocks those seeds loose, so you'll get new ferns. I'm guessing you live in town, so burning is probably out of the question. I'd just cut them off in the spring and give them a good shake, before disposing of them. This should give you a few new ferns every year, to make your patch thicker. The only real advise I will give, is never pick a stalk smaller than a pencil diameter. The first year from seed, you'll get a fern. The second year, you'll get a skinny stalk. The third year, if you've had good conditions, the stalk will be big enough to pick. If you do nothing else, follow the pencil rule and you should be good to go. Now my asparaguns has red and green berries. It is really big and I a dying to cut it down...too early? Elfin wrote: Now my asparaguns has red and green berries. It is really big and I a dying to cut it down...too early? Don't cut it down until it turns brown and "dies". Thank you. Some of the stalks have broken off at the base due to the weight of the rains on the fragile ferns. If I was you, I'd lay the stalk(s) that broke off over the bed. I don't know how big of a patch you have, but if those broken stalks have seeds on them, you want them close. I said it before and I'll say it again, you should leave those stalks stand 'til next spring. I know it's not a pretty plant to have in your yard, but if you want the best tasting asparagus, picked and cooked as soon as you get it in the house, leave it go. If you want some incentive for leaving them go and not have a pretty yard, go buy a bundle at the grocery store and cook it up.... if that doesn't make you appreciate fresh, then tear up the patch and plant petunias. There is new growth, just in the last few days, I don't remember seeing this before, but it wouldn't be there if we'd cut it down. Leave it stand and let nature run it's course. Your patience will be paid back next spring. This is also a good time to identify wild asparagus patches along country roads. You have to remember where those ferny patches are, then revisit them next spring to collect the spears. I visited a very lovely garden on an estate in Lake Forest, which had a prominent thatch of asparagus edging their vegetable garden. It was treated as a feature, which it is every spring. New ferns are exactly what you want! Leave them alone, and in a couple of years, they will be the spears you are eating. New ferns are a sign of a healthy bed. Keep doing what you are doing, and you will be rewarded. People always plant their asparagus where it cannot be seen later. I love its ferny looks. At a private garden in Lake Forest, a home where there is a gardener to execute the tasks of the owner. Their asparagus bed is an edge by the tennis court. It looks very attractive.